Запись великолепного качества, сделанная на студии WDR (West German Radio and Television Network). На этом диске представлен широчайший спектр направлений тувинского искусства Хёёмэй (сыгыт, хёёмэй, каргыраа, борбаннадыр и др.) в исполнении ведущих тувинских мастеров горлового (обертонового) пения. At the "end of the world" or, to be more exact, in the geographical center of Asia, between Siberia and Mongolia, lies the small republic of Tuva. We would still know nothing of Tuva, were it not for this strange and remarkable song, even admired by the overtone experts of the west! 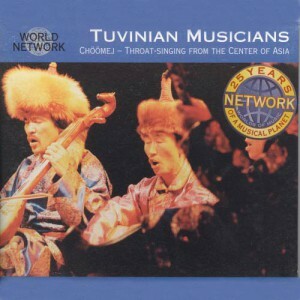 The phenomenal overtone or throat-singing, which the Tuvians evoke from their throats and vocal chords, is among the most astonishing vocal forms in the world. But what may appear to the listener as throat-artistry, (how can a person sing two vocal lines at the same time? ), is the expression and reflection of the centuries-old nomadic life of the herders and cattle-breeders in the solitude of the steppes, the remote mountain valleys, or the Taiga forests. With digital recordings straight from Tuva and the excellent studio recordings made by the WDR (West German Radio and Television Network), this CD presents a fascinating spectrum of the Tuvinian art of the Chöömej, in which the magical sounds of horse-head violins and the Jew’s harp, carry you away, heart and soul, into the vastness of the Tuvinian landscape.